Seat(s): Expanding on a seatguru-esque “9D is a typical Economy Plus Seat” review isn’t easy with this one. There’s the extra legroom and slimmer Boeing style width but little else to report on the seat itself. The legroom is indeed a perk with a few extra inches to stretch and ample knee space even with the seat in front of you fully reclined. Pay a little extra and you get to sit right next to the toilet. – Row 7 washroom aboard a United 737-900. Row 9 (this one) is about as far forward as I’d want to be in United Economy Plus. I’m not sure why it makes sense to have a washroom right next to premium seats in economy and right behind first class but the rows affected most by it’s wafting toilet odors and congregating, pee-pee dancing masses are 7 & 8. Row 7 , in fact, is unfortunately placed right next to the washroom and row 8, directly behind it. It could be hard to justify the extra cash you dropped on a few extra inches of legroom once you find yourself sitting so close to the result of someone else’s unfortunate lunch choice. Gross. 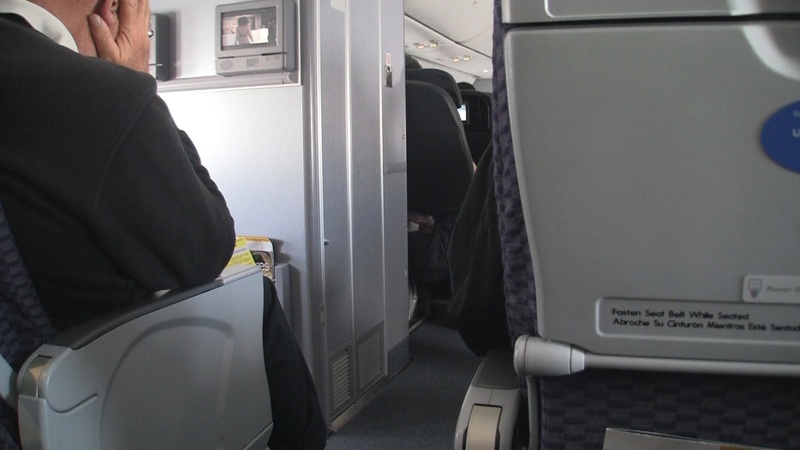 Tech/Connectivity/Entertainment: If all goes as planned, Youll have fairly decent options for keeping your device charged up with power ports underneath the seat, tons of DirecTV channels available for purchase on your seatback TV and eventually (if not already) wi-fi. I’m a big fan of live TV on planes and would even pay for it on this longer domestic flight but mine was broken. I didn’t want to awkwardly move to the open middle seat (as the flight attendant suggested) next to a window seat passenger who would certainly be annoyed by suddenly having a direct neighbor after claiming elbow room victory. I also didn’t feel like being reassigned to a tighter seat further back, so I dealt with it by listening to my limited collection of on-phone music and playing an “unofficial” version of Yahtzee. Food: The roast beef sandwich I had may not be considered “food” by sophisticated culinary enthusiasts but either the high altitude dimmed my taste buds just enough or I simply didn’t mind it. 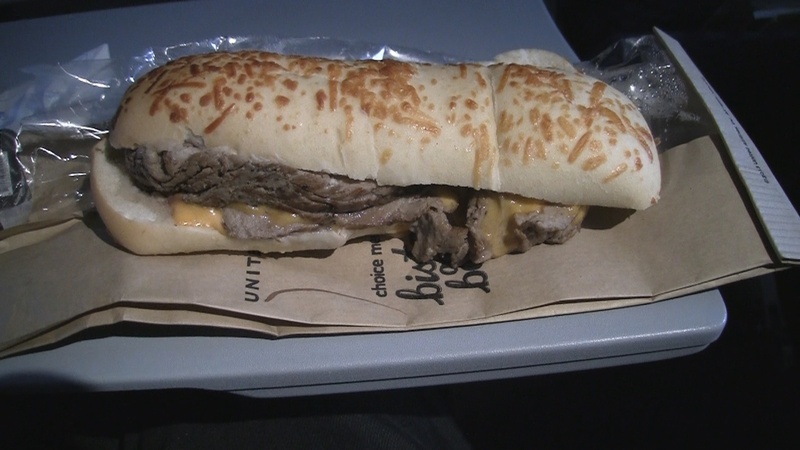 Smothered in Velveeta-style cheese, it certainly isn’t attractive or meant for someone on the South Beach diet but United’s “Choice” menu also offers healthier options on these longer domestic flights. On shorter flights, the menu’s got snacks and snack boxes for purchase. Service: After a brief flirtation with happy United employees not long ago, we’re back to square one. “I want to get home” seems again to be the default setting for often dismissive and unfriendly staff. After recalibrating my expectations several times to give United the benefit of the doubt assuming it’s a few bad apples, I’ve just decided to just consistently expect less. Enjoy the extra legroom, don’t sit near the bathroom and keep it quick with your on-board and gate staff. “Flyer Friendly” seems like a foriegn concept to the crews I’ve dealt with in recent years. Extra upgrade: United did the right thing. 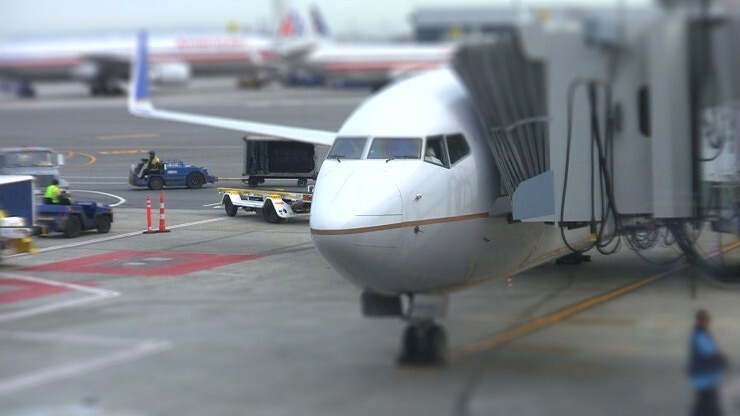 We paid extra for the upgrade to United Economy Plus seating and Premier Access, (which among other things puts you in an earlier boarding group) and United refunded both fees. The broken TV was the reason for the seat upgrade refund. The other refund was for having WAY too many people in “early” boarding group 2. Either there were a rediculous number of United elite passengers, United credit card holders or just about everyone puruchased the upgrade to this “exclusive” group. 3 lanes of higher-numbered groups had far fewer people in them and my carry-on ended up over row 21. If you feel a paid upgrade on United didn’t work as it’s supposed to, the airline has a specific page where you can request a refund. Rating: 2 hops (of 5). Get it: Once your flight is booked it’s easy to purchase an upgrade to Economy Plus using the seat map(s) for your flight at united.com or by calling the airline directly. Yearly Economy Plus memberships are also available. yourself up for some long-term disappointment there.